There is a correlation between a heightened level of physical activity and living close proximity to an urban greenway, according to a new study by researchers at the University of British Columbia. 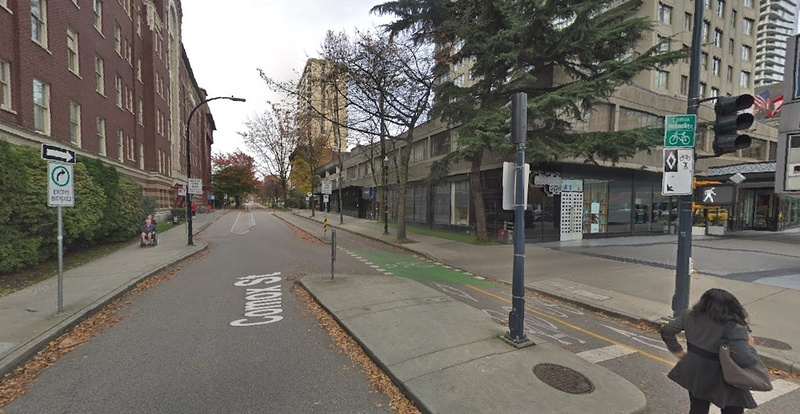 The study focused on those who lived along the Comox-Helmcken Greenway going through downtown Vancouver, which begins at Stanley Park’s edge and ends at Hornby Street. The bike lane path was completed by the City of Vancouver in 2013 at a cost of $5 million. Those who live near the greenway — within 300 metres of the route — saw their odds of achieving an average of 20 minutes of moderate-to-vigorous physical activity double a year after the opening of the greenway. Additionally, the odds of being sedentary for over nine hours plummeted by 54%. These findings are based on self-reported measures of physical activity and sedentary behaviour, with a sample size of 524 participants that had a median age of 44. Surveys were conducted in 2012/13 to establish a baseline and after the completion of the greenway in 2014/15 as a follow-up. Researchers at UBC’s Health & Community Design Lab also previously stated that those who lived near the greenway reduced their car or bus travel distance by 18% daily following the greenway’s completion, with car and bus use falling from 3.4 km per day to 2.8 km per day. Moreover, daily bike trips increased by 32%, while daily trips using a personal vehicle fell by 23%. A separate study performed in Toronto also found increased economic activity along a section of the Bloor Street bike lane route, compared to other areas along the corridor.